Businesses that have existed for decades have an advantage when it comes to customer loyalty, but they face the very real prospect that the organization will fade away as customers grow older. The solution, to get more young people interested in a business, is obvious but difficult. Although every generation is different from the one that preceded it, the generation born between the early 80s and 90s had a front row seat to some of the biggest changes in information technology since the printing press. Understanding how the members of Generation Y are different from older generations (and how they are the same) can help organizations remain relevant for years to come and to make the best use of new business technologies like social media. There are more than 80 million members of Generation Y in the US, and even on a global scale, the median age of the world’s population is 26. Regardless of the scope of an organization, there is a tremendous value is reaching out to younger consumers. Not only will attracting younger clients help ensure the longevity of an organization, but Millennials have become an important demographic for just about every market. Organizations that don’t take the effort to engage this generation risk losing ground to their competitors at a rapid pace. 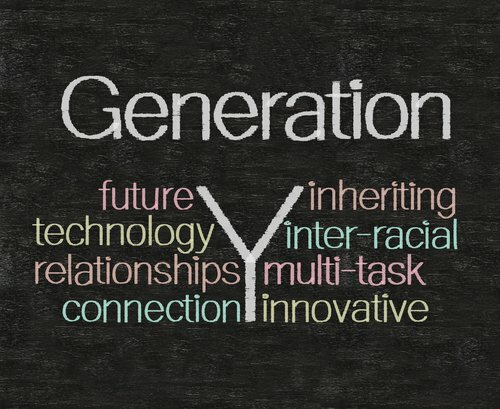 The first step to bridging the generation gap is understanding what people mean when they talk about Generation Y. When people speak of Generation Y, they are normally referring the generation of people born between the 1980s and early 1990s (though the end point is sometimes extended to those born in the year 2000). They are called Generation Y because they are the generation that followed Generation X. They are sometimes called Millennials, since they are people who first became adults after the year 2000. Generation Y is the most educated, ethnically diverse, and largest generation of Americans ever. By 2030, the U.S. Census Bureau estimate that Generation Y will make up 22 percent of the U.S. population. Despite the troubling economic times, Millennials past their mid-20s have relatively good incomes. The average salary for Millennials aged 25-34 is $41,000 for men and $33,000 for women. There have been a lot of negative reports about Generation Y, but advertisers and marketers should take them with a grain of salt. While some commentators are quick to portray Millennials as lazy, self-centered, and cynical, these are the kinds of claims that older generations always make about the young. It’s easy to forget all the fuss people made about Generation X (grunge music, ripped clothes), Baby Boomers (hippie counterculture), and even seniors (Beatniks) when they were young. In fact, a study of responses to a survey given to high school seniors from 1976 to 2006 showed there was little change between generations for things like self esteem, egotism, and attitudes about the future. Most Millennials are very techno savvy. Nearly 9 out 10 own a laptop, and just about everyone in the age group has some form of access to the internet. In a telling statistic, more than 25% of young people (high schoolers and college students) consider their laptop to be the most important item in their bag (almost three times the number of students who chose their textbooks). Another characteristic of Generation Y’s use of technology is reflected in the way they communicate. They are more likely to use faster forms of communications like SMS, social networks, and emails. Generation Y are key targets for social media marketers because they respond favorably to social media messages. According to recent research on the social media habits of young people, 66 percent lookup stores their friends have checked in to, 71 percent report having liked a brand on Facebook to receive a special offer, and 4 out of 10 visit Facebook 10 times or more per day. This is important to marketers because Generation Y members are less trusting of traditional advertising. They trust the opinion of friends more than advertisers, and social media makes it easy for them to get opinions on just about any topic. With such high rates of internet and social media usage, it should come as little surprise that Generation Y leads the US in smartphone ownage. According to recent research from Forrester, 72 percent of Millennials have smart phones. They are also the most likely group to have iPhones and use apps on their smartphones. This isn’t just a case of younger adults being quicker to adopt new technology, though that’s certainly a part of it. Rather, Millennials are the people who are most likely to want a smartphone, understand it’s useful and relevance, and have the money to buy them. This makes Generation Y members good target audiences for mobile marketing campaigns. The members of Generation Y are also more likely to be freelance workers and entrepreneurs than the general population. For a generation of people who have grown up with the internet, computers, and mobile technology, using the tools of the digital age for business comes naturally. Members of Generation Y are also likely to confident and ambitious. The success of young people like Mark Zuckerburg has led many to strive for independence in their work situation. This means advertisers and marketers should rethink traditional notions that people in their 20s and 30s aren’t concerned about business opportunities. In fact, because of their skills with social media and entrepreneurial spirit, people in this age group are good targets for professional networking and business to business marketing. Here is something to keep in mind when using this demographic information. While it may be useful to use demographic data to decide how to target groups and what messages to use, don’t use the data to stereotype individuals. It’s wise to target Generation Y audiences through social media, since so many people in the age group use it, but it would be a serious faux pas to assume every young person you meet uses Facebook or is great with technology.